Different cultures have different traditions. I passed this sign the other day in Roppongi Hills and stopped short. 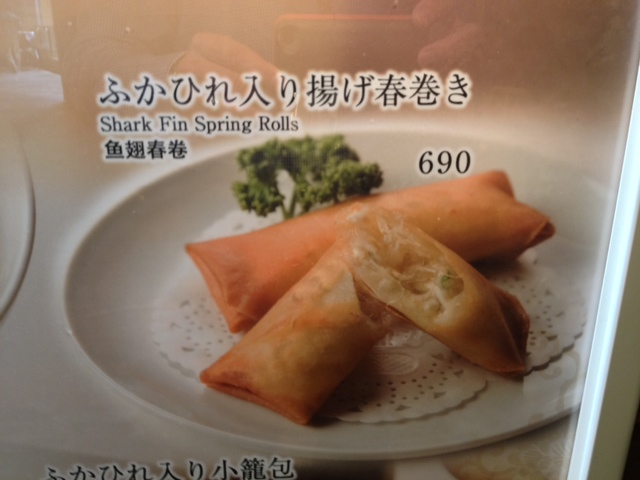 If you have not heard about the process of shark finning, read about it here. A terrible, cruel thing where they catch the shark, cut off it’s fins while it is still alive and then throw it back into the ocean to die a horrible, painful death. If you are not convinced that this is truly barbaric, this 2 minute video should be enough to turn you off shark fin soup for good. Those big, bad, terrible sharks are disappearing at a rate of 250,000 a day through fishing, finning and as collateral damage from commercial fishing and face extinction if we don’t do something. How will the ocean ecosystem change if one of their top predators disappears? Barbaric. But then so is tying a dog outside all year long and never giving it attention. I won’t be eating there .. ever. This entry was posted in Random Thoughts and tagged animal cruelty, animal rights, animals, ban shark finning, Japan, Roppongi Hills, shark fin soup, shark finning, sharks, stop shark finning, Tokyo, video by michaelweening. Bookmark the permalink.